The Hawkes Racing team has claimed two of the three stakes races for the new season's three-year-olds so far and is well placed to win the next. CHAUTAUQUA is the thoroughbred sprint king of the world after a stunning victory in the Chairman’s Sprint Prize at Sha Tin, demolishing a glittering field to earn a trip to Royal Ascot. Co-trainer Michael Hawkes believes Binary is "probably another preparation away"
The half-brother to Black Caviar, who was sold for $5 million during this week's Inglis Australian Easter Yearling Sale, will be trained by Hawkes Racing. Will Saturday be a lucky day for team Hawkes? Josh Adams is using adversity and despair as a powerful motivating force to get his life and riding career "back on track"
Three years ago, Team Hawkes had the world at their feet and walked away from it all. 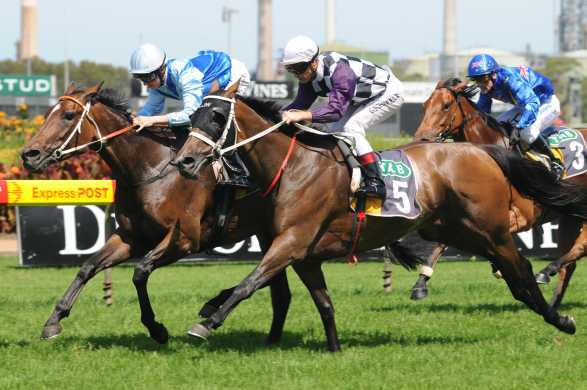 Now training's first family say "We're back, baby"
Fiumicino raced back into Group 1 form with a tough well deserved victory in the 2009 BMW Stakes (Group 1). Rainbow Styling will back up next Saturday in the Tattersall's Cup following his win in the Ipswich Mile. Dao Dao capped a fantastic day for Hawkes Racing, by winning the final race of the 2009 Golden Slipper carnival.